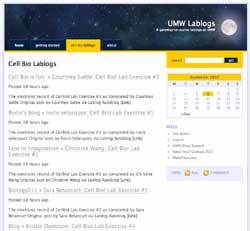 One of the biggest experiments happening currently on UMW Blogs is Steve Gallik’s Cell Biology Lablogs. Steve is a pretty amazing guy, he has built out an entire suite of online laboratory resources wherein students can record the results of their experiments in what he terms an Online Laboratory Suite. Well, if that’s not impressive enough, Andy Rush and Steve Gallik have conceptualized a way to take the experiment results for each student and create and RSS feed for it (Steve once again did all the programming). Now, let’s think about this -we have students with online labs that have both an HTML version and an XML version that is RSS ready and that can easily append every new experiment to the XML file. Do we have any technology that may be able to publish the individual students labs automatically on some kind of digital space that is their very own and that they can do whatever they see fit with it? 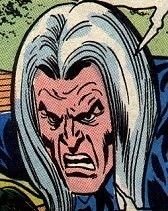 UMW Blogs, baby! More specifically, we have UMW Lablogs. How we accomplished this was a bit of a work around, but 75 students later everyone in the lab was able to set up their own Lablog and successfully feed their own, unique XML file containing their labs into their own blog space. There is a step-by-step tutorial that will take you through the details that each student was expected to do, and after a week I am more than pleased to report that it worked beautifully thus far. As of now each blog post for each respective experiment contains a link to the online HTML file containing the data, results, graphs, etc. It should be a small leap to have all of the data in the HTML file feed directly into the blog post making the coup complete 😉 This is very much still a work-in-progress, but I can’t help but think that Steve Gallik is on to something very, very big! I think the “lablogs” tag on the UMW Blogs tagcloud suggests just how big. So, in short, Steve Gallik and Andy Rush have sprinted right out of the gate, pusheding the boundaries of UMW Blogs to the next level. You guys rule the digitized school! And who’s more digitized than UMW again? This entry was posted in wordpress multi-user and tagged aggregation, experimenting, lablogs, rss, wordpress multi-user, wpmu. Bookmark the permalink.